From the Nordic coolness of Iceland, Skalmöld dash again with a fiery Viking metal style that defies every winter and even brings the thickest ice floes to melt. Their upcoming album “Með Vaettum” connects seamlessly with the previous efforts “Baldur” from 2010 and “Börn Loka” from 2012. 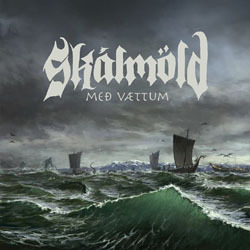 On “Með Vaettum“, Skalmöld celebrate and perfect Viking metal with the whole body and pull fans with heroic, mythic texts, epic stories and tangible instrument technology into the spell. Clearly visible, as on the cover artwork, these weather-beaten Vikings can neither harm wind nor weather. The evocative artwork was done by Ásgeir Jón Ásgeirsson (Asgeir Jon Art), who also did the artwork for “Börn Loka“. The album will be released via Napalm Records on November 14th 2014 and the limited first edition digipak CD that includes 2 bonus tracks is already available for pre-order in their label’s web-shop.